For my third entry in the virtual potluck over at Appetite for China , I know I don’t want another meat dish. 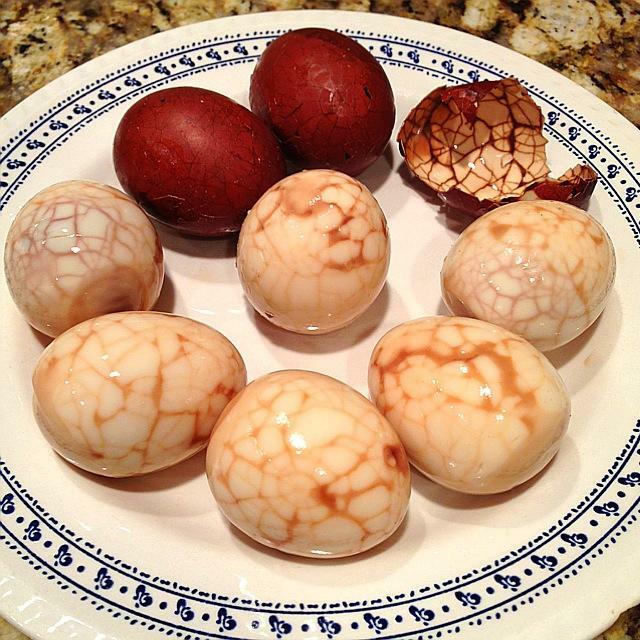 The Chinese Tea Eggs recipe appealed to me because the marbled effect looks so much prettier that the convenience store tea eggs I’m used to growing up in China. If I hadn’t read Diana’s post I would’ve never guessed how easy it was to create the “spiderweb” look for these healthy and delicious eggs! It sure was a lot of fun to tap and crack the hard boiled eggs before simmering them and just watch the beautiful marble effect create itself after a couple of hours. Who would’ve thought! The idea of adding a cinnamon stick was strange to me at first, because in the past, I’d think the only acceptable ingredient would be Luo Han Guo, which would add a nice sweet touch to the liquid. But I’m sold as soon as the liquid reached a boil and it smelled so good I almost helped myself to it! I bet if I had dried mandarin peel on hand it would be even more wonderful. Next time I eat mandarin oranges guess what I’ll be saving! I followed the steps religiously and turned off the heat at the 2 hour mark but left the eggs submerged in the liquid for another 2 hours. Next time I’ll probably let it simmer for much longer as the eggs didn’t taste as salty as I expected them to be. Maybe if I didn’t drain the liquid, but I got another use out of it: I blanched some Kombu and used the remaining liquid to cook it, that was my veggies for last night! After that though, I couldn’t possibly reuse the liquid because it’d turned slimey. I love recipes where ingredients can be reused. I’m already planning for the next dish before the deadline of the virtual potluck. I’ve been having such a blast and I encourage anybody to participate! Don’t forget to check out Diana’s book “The Chinese Takeout Cookbook” on Amazon http://www.amazon.com/Chinese-Takeout-Cookbook-Dishes-Prepare/dp/034552912X/ where this recipe can also be found. In a large bowl, mix together the rice wine, dark soy sauce, sugar, garlic, hoisin sauce, and five-spice powder. 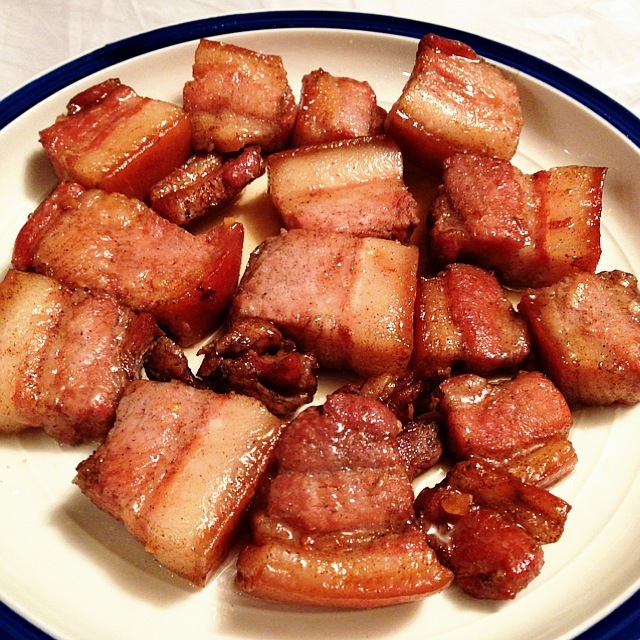 Rub the pork belly with the marinade mixture and marinate for 2 to 3 hours in the refrigerator. Preheat the oven to 325°F. Rub the excess marinade off the pork belly (but don’t rub it all off!) and place in a roasting pan. Brush the top with the honey. Roast the pork for 40 to 45 minutes, flipping the pork belly over half-way through and brushing honey on the other side. The pork is done when the outsides begin to crisp and blacken, and the center of the pork belly strip feels firm. I used every listed ingredients and left the meat in the marinade for about 8 hours. The pork belly in my freezer was already sliced. Next time though, I’ll probably go for a much leaner cut. As roasting the pork belly really makes the fat parts chewy, not like braising would make it soft. Our entire kitchen was filled with authentic Chinese BBQ aroma and it was so hard to wait for the Char Siu to cool off before digging in. The Chinese five spice powder was a killer touch! Thanks to Diana. 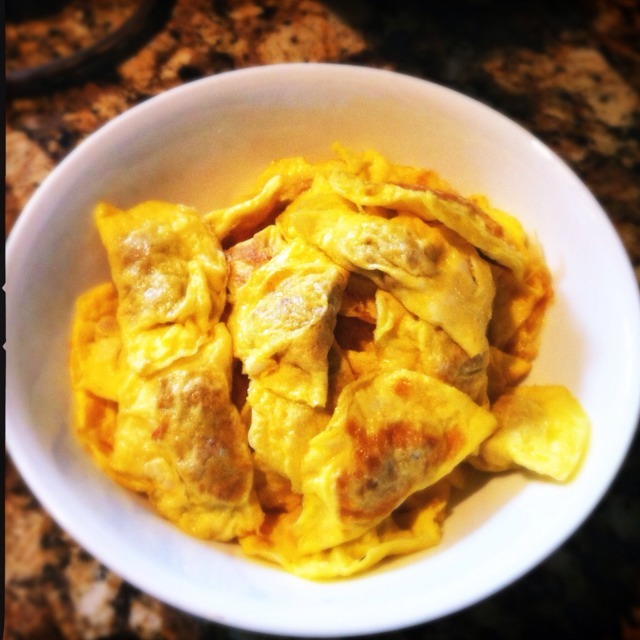 It reminds me of the meat in Cantonese style Zongzi (rice dumplings or Chinese tamale). We ate about half of it in one sitting! 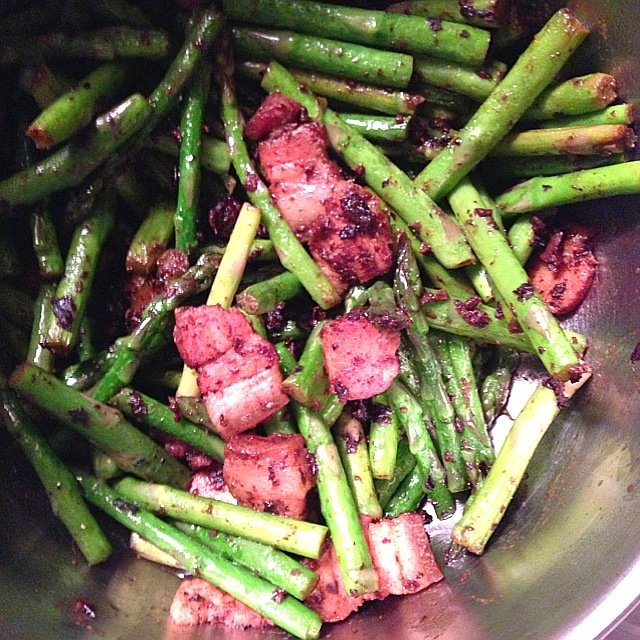 The next day, I sliced the leftover very thin (much easier to slice now that they’ve been in the fridge and had time to harden up), added a little bit of red food coloring to make it look more like Char Siu in a BBQ-joint, and made a delicious stirfry with asparagus and fermented black beans. Now that’s something we could eat all week long! 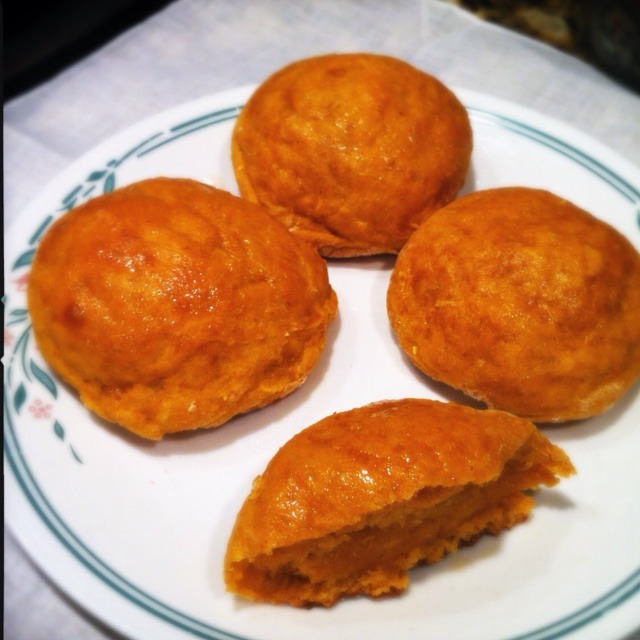 I am so excited about this virtual potluck over at Appetite for China! What a wonderful idea! Before this, I’d already clipped tons of recipes from the ingenious Diana, this event pushed me to finally make a few of them. 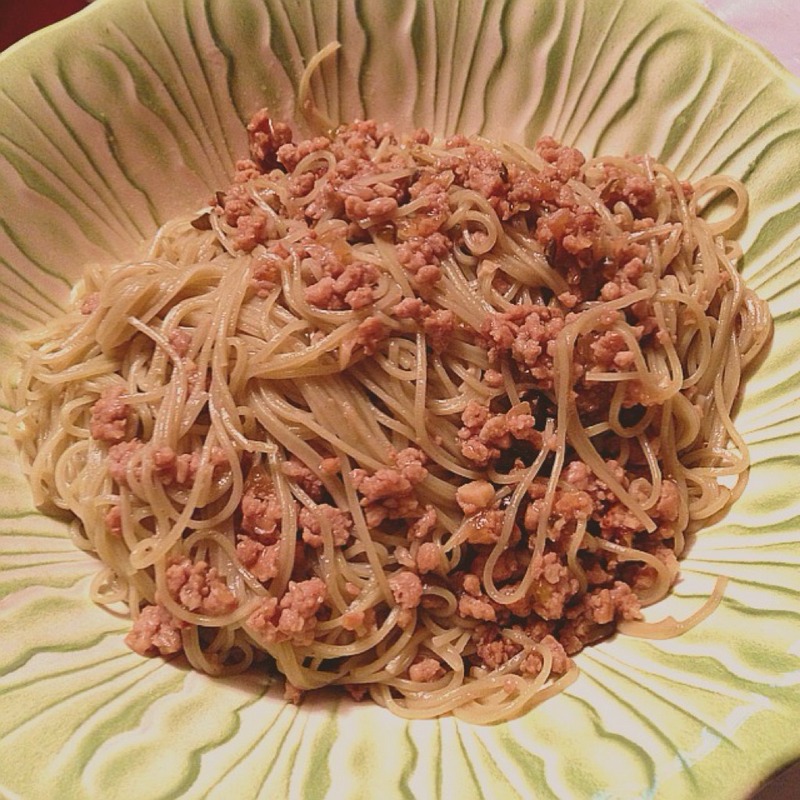 My boyfriend and I are definitely noodles people, and we happened to have some ground pork on hand, naturally, we went for the Dan Dan Noodles. 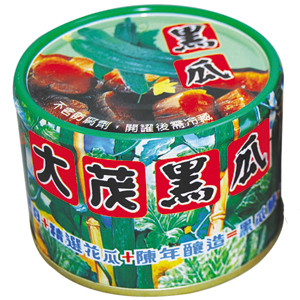 2 tablespoons chopped Sichuan preserved vegetable (optional) used finedly minced Taiwanese preserved cucumbers instead, one of his dad’s secret ingredients! We followed Diana’s directions pretty closely. Since the meat sauce is very similar to a Taiwanese minced pork dish, I asked my boyfriend’s dad for advice. 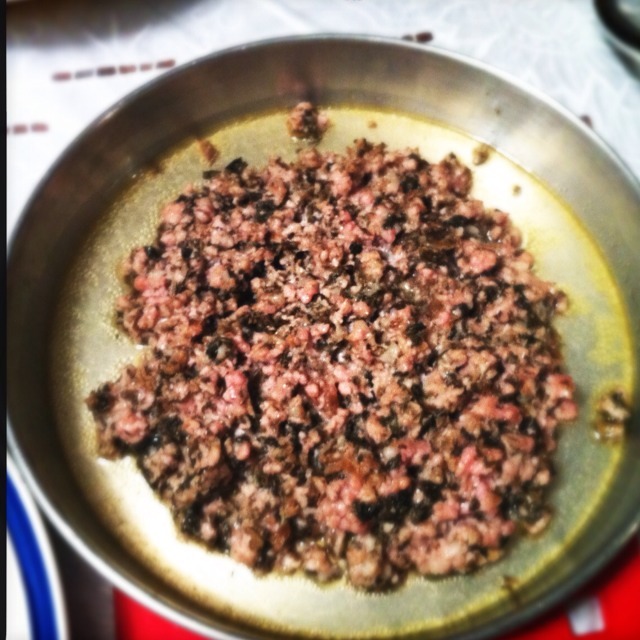 And he strongly recommended using onions (since it’ll blend “right in” to the meat sauce) and said a little bit of rock sugar and some finely minced Taiwanese preserved cumcumbers (photos follow) would create a wonderful contrast to the meat. He was right on! These Dan Dan Noodles are a real treat! If you walked right into our dining room at dinner time you’d have to excuse us because we were slurping so loudly on the noodles! We had some more meat sauce left so the next day for lunch, I poured it over white rice, it was just as yummy and hearty! Now that lead me to think it might work on other grains such as couscous and quinoa. I know I’d be making this over and over, it’s definitly a recipe worth keeping! Don’t forget to check out Diana’s book “The Chinese Takeout Cookbook” on Amazon http://www.amazon.com/Chinese-Takeout-Cookbook-Dishes-Prepare/dp/034552912X/ where this recipe can also be found. Preheat oven to 400 degrees. Microwave grape jelly until it’s warm enough to stir in cashew nuts and 1 tbs. honey (I heated the jelly a little too long and it became runny, so I added a teaspoon of cornstarch to thicken it). Let cool. Combine flour, sugar, and butter in a bowl of food processor, pulse until it resembles coarse crumbs. Add just enough cold water to bind into a soft, nonsticky dough. 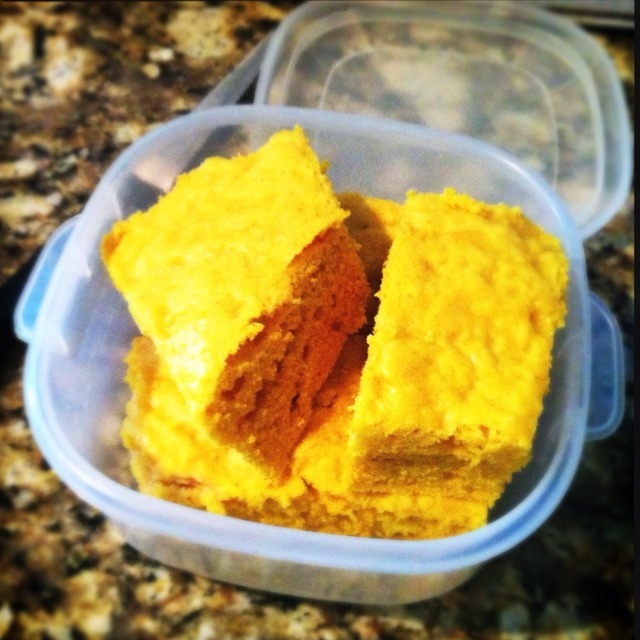 Roll out the dough on a floured surface to two rectangles. Spread the jelly/nut mixture to within 1/2 inch of edges. Top with the second piece of dough. Press edges to seal together and then impress with a fork. Glaze with milk. Transfer to baking sheet and bake for 20 to 25 minutes until light, golden brown. Brush with honey and cool for 5 minutes. Cut into 6 slices. I have to confess, the original version is better, even though I’m not a dates fan, you could manage the amount of sweetness with the filling (the honey called for in the original recipe really isn’t that much, particularly when lemon juice is used). With the store-bought jelly, I really have no control over the sugar level. Pistachios are crunchier than cashew nuts, for the next tart, I will make sure to stock up on pistachios! The tart shell is as delicious as homemade can get, in my opinion. It’s going in my book as a base pie/tart/shell recipe, I’m so excited to have found it! 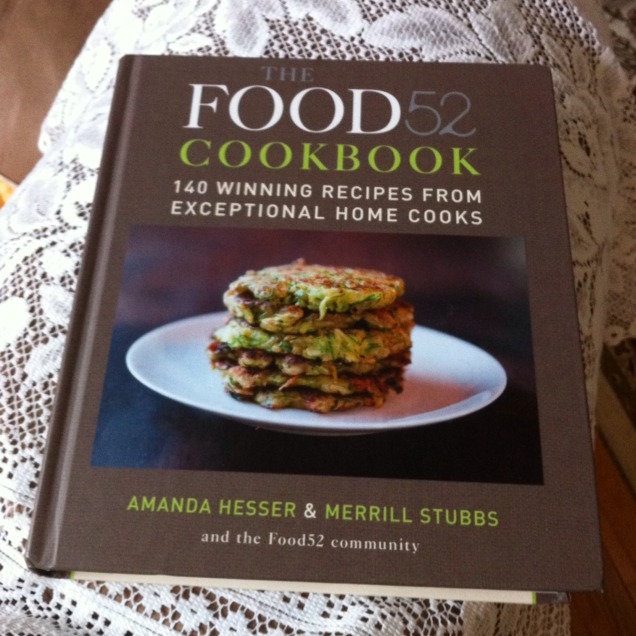 Book won from Serious Eats! Ta-da! Fancy Mochi Rice desserts, fresh from L.A.! Now every day I will be eager to finish my lunch, so to reveal the bottom of the bowl; because, look at how cute it is! Today is my parent’s boss – Lynne’s birthday; we invited her over for some home-made food to celebrate the day.